Arkham House, 1982; 338 pp. ; limited to 4,081 copies. First Edition. Early in 1970 a young instructor at the Air Force Academy in Colorado Springs placed his first story, Pinon Fall , with the editor of Galaxy magazine. 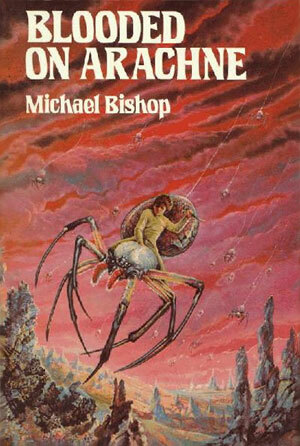 Other stories would follow over the next several years, but it was with the appearance in 1973 of two astonishing nouvelles, including The White Otters of Childhood referenced below, that Michael Bishop was acknowledged as one of the most important new writers to emerge in science fiction during the seventies. This extended 352-page volume is the first collected edition of Bishop s fiction and includes several works nominated for the Hugo and Nebula Awards: Blooded on Arachne, Cathadonian Odyssey, Effigies, The House of Compassionate Sharers, In Chinistrex Fortronza the People Are Machines, Leaps of Faith, On the Street of the Serpents, Pinon Fall, Rogue Tomato, Spacemen and Gypsies, The White Otters of Childhood, plus two poems, Among the Hominids at Olduvai and For the Lady of a Physicist. With eleven charcoal drawings by Glennray Tutor and jacket by Ron Walotsky.